Although as Divers, we mainly want to dive, sometimes the pool is the only option. Pool sessions are held regularly at Cripps Swimming Pool in the grounds of Northampton General Hospital. The Dive Club meets, as in sits around with a drink and chats, on a Thursday and Sunday evening after the Club Pool Session. We go to the Cheyne Walk Club for the drinking and chatting bit. Click here for more information and a map from the pool. The Pool is crystal clear, 25 metres long and in the deep end is 3 metres deep, ideal for practice (try out that new equipment) and for training. We cannot promise that you will see too many fish, but we can promise you a great time! After the pool session the fun continues in the Cheyne Walk Club Bar situated just across the road from the Pool, where cheap drinks are served till late at night. Lots of club members come to these sessions to arrange trips and to meet new friends. 10% Discount on all standard PADI Courses. Discounts on Swimming Pool Equipment Hire - usually £10. Up to 10% discount on all shop items. First chance at purchasing second-hand items. Free use of Pool for up to three and a half hours per week. Social Events and Club activities. First call on all second-hand kit sales. First call on our regular dive trips. DIVE Northampton Travel Club Membership. All the benefits of Bronze Membership. All the benefits of Silver Membership. There is no minimum period for Membership and a Club Member can switch between levels, once a year, at no cost. * Kit is subject to availability and is a daily basis. Membership is paid by standing order. 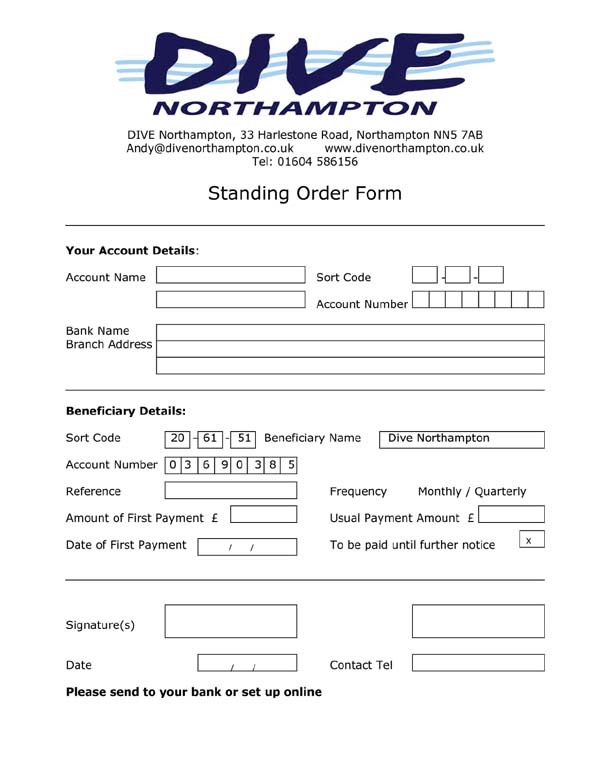 Click here for a copy of the standing order form (pdf format). If you have difficulty viewing the PDF, try a JPG version here. The Travel club, in association with Savvi Travel, is a way to provide holidays to members at a discounted rate. Our Travel Club is dedicated to finding Club Members 'the best holidays at the best prices'. The Club always aims to beat any discount off tour operators' brochures that you could find in the High Street travel agencies.You can now book the best car hire prices and accommodation on-line through the Club Website. we also run at least two trips to the Red Sea every year and also run regular trips to the coast, mainly at weekends.